Got a bunch for brunch? Cream Eggs are scrumptious and easy to make. The classic version pairs mustard with tarragon, but see notes below for some of my other favorite flavor combinations—or create your own. Heat oven to 350°. Butter the bottom of an oblong casserole dish. Add mustard to cream, and pour into dish. Break open eggs one at a time on top of cream, taking care to leave whole. Salt and pepper to taste. Distribute grated cheese. 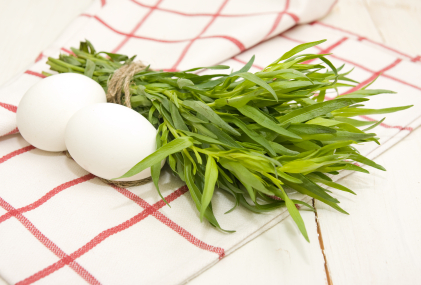 Check eggs after 15 minutes, and sprinkle with tarragon. Bake for a total of 20–25 minutes, or until eggs are set. •Flavor cream with roasted garlic; fresh basil in place of tarragon. •Cream: Shallots, sliced thin and sautéed. Cheese: Goat. Herb: Italian parsley.